These concerts are made possible, in part, thanks to support from Yamaha and the Foundation for Contemporary Arts Emergency Grant. 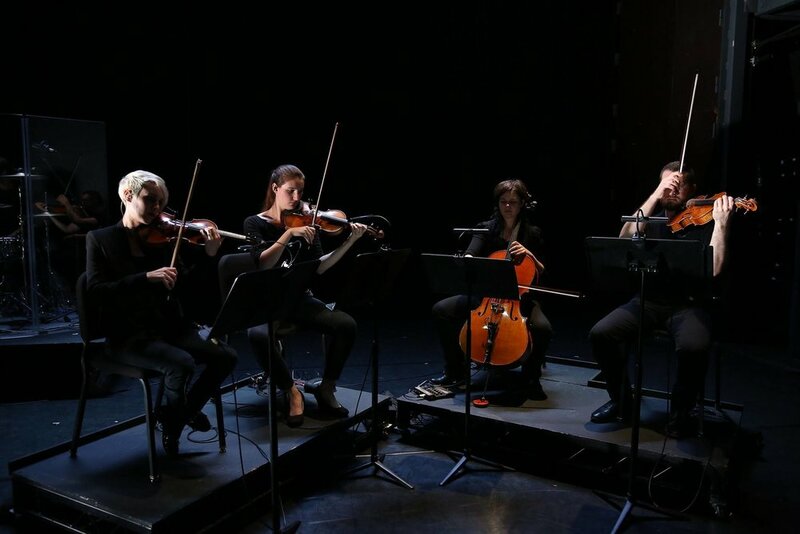 Featuring internationally acclaimed artists Amy Knoles, Ajay Kapur, and Ulrich Krieger, Machines and Strings is an interdisciplinary project curated for REDCAT and CalArts by the Isaura String Quartet. An immersive concert experience, Machines and Strings brings together CalArtians from the disciplines of Music, Theater, Critical Studies, and Integrated Media, pushing the boundaries of artistic expression and elevating voices that are often underrepresented in a concert hall setting. In total, Machines and Strings presents the world premiere performances of four new compositions. Isaura presents the world premiere of Ulrich Krieger’s completely revised quartet Up-Tight II, and joins the KarmetiK Machine Orchestra, directed by Ajay Kapur, performing with custom-built robotic musical instrument Lydia in a new work by Amy Knoles. The program also features works by Chrysanthe Tan, Stephanie Smith, Sarah Belle Reid, April Gerloff, and Jules Gimbrone, which will be performed in collaboration with interactive lighting and projection by alumni artists from the 2018 CalArts Expo creative team including RS Buck, Josephine Wang, and Kamyi Lee. Ajay Kapur is the the Associate Dean for Research and Development in Digital Arts, Office of the President, as well as the Director of the Music Technology program (MTIID) at the California Institute of the Arts, He received an Interdisciplinary Ph.D. in 2007 from University of Victoria combining computer science, electrical engineering, mechanical engineering, music and psychology with a focus on intelligent music systems and media technology. Ajay graduated with a Bachelor of Science in Engineering and Computer Science from Princeton University in 2002. Ajay is a Musical Scientist and Digital Luthier, building customized instruments from microchips, recycled parts, and imagination. He has spoken, performed and published over 150 technical papers in the area of modern day digital orchestras, new interfaces for musical performance, and artificial intelligence. Amy Knoles, Associate Dean; Larry Levine Chair in Contemporary Music, Faculty of Electronic Percussion at the Herb Alpert School of Music at CalArts, performs original works around the globe. She is a recipient of the ASCAP Foundation "Composer-in-Residence at the Music Center of Los Angeles", the Meet the Composer “Commissioning Music USA”, the "UNESCO International Prize for the Performing Arts", C.O.L.A and has worked with the LA Phil, Kronos Qt., Rachel Rosenthal, Frank Zappa, Pierre Boulez, Morton Subotnick, Robert Henke, Ensemble Modern, Flea, Bang On A Can, Ulrich Krieger, Alison Knowles, John Cage, Elliott Carter, Morton Feldman, David Rosenboom, Mauricio Kagel, Vinko Globokar, Louis Andriessen, Lucky Mosko, Charles Wourinen, Arthur Jarvinen, Steve Reich, Tod Machover and many others; has recorded over thirty CDs/vinyl of contemporary music. Her work has been described as being of: "frightening beauty, fascinating, complex" by National Public Radio and she is described as "Los Angeles' new music Luminary, infinitely variable, infinitely fascinating" by the Los Angeles Times. Named by Arts Boston as “1 of 10 Contemporary LGBTQ Composers You Should Know in 2018,” Chrysanthe Tan (she/they) is an autistic, Cambodian-Greek-American composer, violinist, and songwriter. Their solo work features electroacoustic baroque pop incorporating violin, looping pedal, vocals, and poetry, while her compositions feature spoken word and literary influences. Chrysanthe’s work has been performed at the Metropolitan Museum of Art, Rockefeller Center, New Orleans Jazz Festival’s Rising Artist Series, US Embassy in Cambodia, ÆPEX Contemporary, Los Angeles Contemporary Exhibitions (LACE), Syros Sound Meetings, and more. In 2015, she released her debut album Stories and was named an ASCAP Spotlight Composer. As a violinist, Chrysanthe has toured internationally, recorded, and performed with artists like Ariana Grande, Paul Anka, Halsey, and Bastille and performed on TV shows like Glee and the American Music Awards. In 2015, she toured the world as pop star Ariana Grande's violinist on the Honeymoon Tour. In 2017, she played violin on Halsey’s platinum album Hopeless Fountain Kingdom. Outside of her own music, Chrysanthe is a published writer and the co-host of Underscore, a podcast and new media project produced by 91.5 Classical KUSC that features innovative artists making music beyond the boundaries of classical. Future Lover is a darkwave inspired, electronic dance duo that creates dark, driving, tracks entwined with cloudy, reverb soaked vocals. Daniel Crook uses only hardware to produce a floor of sound with intense beats and haunting synth, while Scarlett Perry delivers somber vocals that float overhead. Both have a strong musical background that they expanded while attending the California Institute of the Arts. The pair met while studying in the music school, Crook in music technology and Perry in vocal performance. 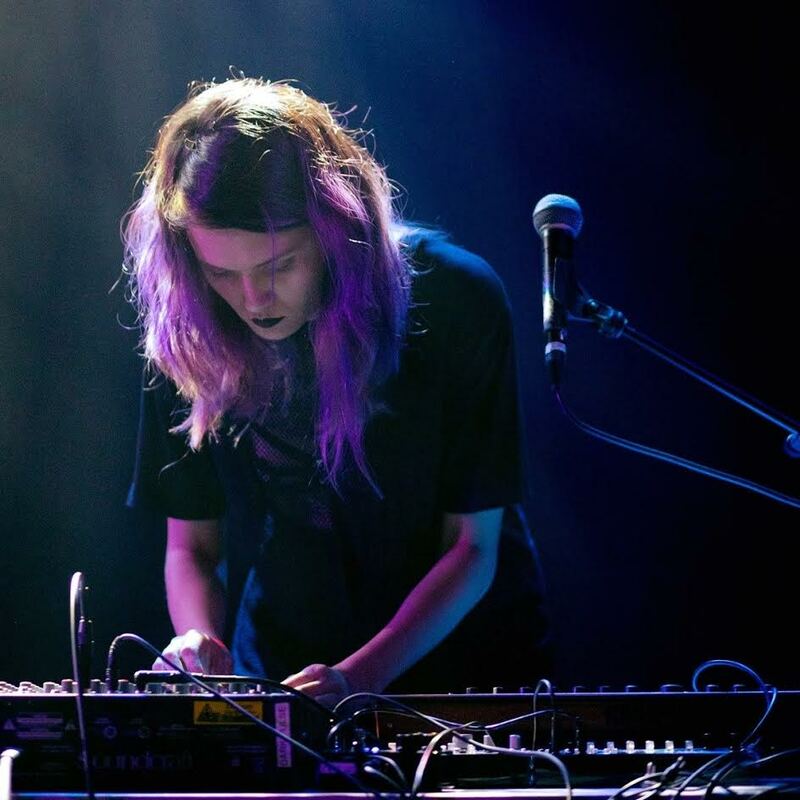 Future Lover formed in early 2017, through their shared love of darkwave and industrial dance music and a desire to perform live using hardware. They value the spontaneity that hardware brings to a live performance by lending itself to the possibilities of improvisation, allowing each performance to be unique. Violist Jonathan Morgan specializes in the music of living composers. He’s a founding member and Executive Director of the Now Hear Ensemble. Jonathan is on the artist roster of the Aerocade Music label, on which he released a recording of Nick Norton's Elegy II and is donating all proceeds from the recording to the ACLU. This season, Jonathan is giving world premiere performances of newly-commissioned music at the Society for Electro-Acoustic Music in the United States (SEAMUS), Los Angeles City College, and has performed at the NOW Festival, the New York City Electroacoustic Music Festival, the Eureka Musical Minds of California Conference, Synchromy, the Carlsbad Music Festival, the Roy and Edna Disney CalArts Theater (REDCAT), and the UCSB Summer Music Festival. Jonathan is a member of the Opera Santa Barbara Orchestra and has performed as principal violist of the Santa Barbara Choral Society, Santa Ynez Valley Master Chorale, and as soloist with the Choir of St. Barbara Parish. He can be heard on three albums; My Hope is Arisen, Made in California, and The Lament Cycle. Jonathan holds a B.M. from the Peabody Institute of the Johns Hopkins University, a M.M. from the Cleveland Institute of Music, and a D.M.A. from the University of California Santa Barbara. He has been recently appointed to the viola faculty at CalPoly San Luis Obispo and is former faculty of violin, viola, and chamber music at the Preparatory and Continuing Education Department of the Cleveland Institute of Music. Visit JonathanMorganMusic.com to learn more. Josephine Pu-Sheng Wang is a Taiwanese lighting designer/artist based in Los Angeles. She received a B.S. in Computer Science and Information Engineering in 2015 from National Central University, Taiwan, and a B.F.A. in Theatre Lighting Design in 2018 from California Institute of the Arts. Her interests range from music, dance, theater, art installation to themed events and social movements. She has designed lighting for the productions directed by Jessica Hannah, Heidi Duckler Dance Theater, and James Franco. She has brought her artwork overseas to Cuba and Edinburgh Fringe Festival. She has also been developing unconventional design techniques for performances, installations and everything in between. Josephine speaks Mandarin Chinese, Taiwanese and English. Benefiting from different cultural backgrounds and previous professional experience, she hopes to be a technological innovator in the field of lighting design, bridge the gaps between classes, races, cultures, and dedicate her life to pursuing social justice and human rights all over the world. Jules Gimbrone (b. 1982 Pittsburgh; lives and works in NYC) is an artist and composer who asks how social performance is codified, captured, and transmitted through multi-modal perceptual differentiations. Gimbrone uses a variety of recording and amplifying technologies, in addition to materials like glass, clay, ice, mold, and the processes of decomposition, to investigate how sound travels through space, bodies, and language as a way of exploring sublimated power systems, and to expose the multiple queerings of the performative and pre-formative body. For Gimbrone, sound is more methodology than medium and can take form ranging from sculpture, recordings, performances, installations, and scores. Gimbrone’s works have appeared at such venues as Stellar Projects, SculptureCenter, ISSUE Project Room, The Rubin Museum, MOMA PS1, Human Resources LA, Park View Gallery, Vox Populi, and Théâtre de l’Usine, Geneva, Switzerland. Gimbrone received an MFA in Music Composition and Integrated Media from CalARTS in 2014. Kam Ying (Kamyi) Lee is an interdisciplinary artist who is interested in contemporary and experimental uses of digital media. She focuses on video design, immersive design, light art, architectural projection, and interactive programming in art installations and live performances. Kamyi hopes to forge new relationships between humans and their surroundings by integrating different use of technologies. She explores the possibilities of how art can go beyond two dimensions, and how people can perceive art in alternative world settings. Her selected previous credits include: A Dream of Light (Ruins of St. Paul’s, Macau Arts Festival), Mapping Made in Macao I & II (Tap Seac Square and Mandarin House, Macau Arts Festival), Kiss (dir. Monty Cole, Walt Disney Modular Theater), Kolob (dir. Jodi Porter, Sharon Lund Disney Theater), Dreamscape (dir. Jonghee Woo, Long Beach Pump Festival), Membrane (LA Vortex Dome) and The Galaxy Above you (Automata). Kamyi is founder of Macau based creative design studio Atelier Cocorico. She is currently studying for a Master of Fine Arts in Interactive Media for Performance at California Institute of the Arts. McLean Macionis is an artist, composer and technologist based in Los Angeles. His mission is simple: to create experiences that inspire others to connect rather than disconnect. For the last several years, he has written music for film, television and other digital media projects, amassing a list of credits that includes networks such as Bravo and E! and companies such as General Electric. Outside of the studio, he has performed in collaborative interdisciplinary works such as Gifts of the Spirit by Ron Athey and The Broad Museum and Drifting... A Suite of Dreamscapes by Deborah Rosen & Dancers. In the world of academia, McLean has been involved in forward-thinking research on new ways of music making. His work is published in the Proceedings of the International Conference on New Interfaces for Musical Expression. A passionate learner and devotee to his craft, McLean is currently pursuing a masters degree in music technology from California Institute of the Arts. Nathan is a composer and media artist focusing on microtonality, interactivity and form. His approach to art is strongly influenced by his affinity for technology and his theatrical background: after finishing his BFA in Opera at the University of California, Santa Cruz, Nathan wrote and directed musicals for children at Young Performers Theatre in San Francisco. Now he's finishing up a masters degree in music technology at California Institute of the Arts, where he has been a creative producer for the CalArts Expo, a sound designer for Fahad Siadat's dance opera The Moon Has Made Us Brothers, and a collaborator in various other intermedia performances and projects. Buck is an international lighting designer for theatre and dance, as well as a creator of immersive environments and interactive media. In LA, their work has been seen at the Ford Amphitheatre; Automata Arts; REDCAT; and more. Upcoming work includes: Lighting and Projection Design for the 18th St. Art Center's 30th Anniversary; Lighting Design and Production Management for Invertigo Dance Theatre's national tour of Formulae and Fairytales; Lighting and Production Management for Nomadic Survival Disorder or the Game of Boundaries at Highways; an interactive light sculpture, The Enchanted Listening Tree, displayed at the Santa Paula Art Museum in the Land of Light event. They received their MFA from CalArts. Rachel Iba is a violinist and performance artist who creates and performs in a diverse range of spaces. Both a modern and baroque violinist and violist, Rachel is featured on more than 10 professional recordings, including collaborations with Derrick Spiva, Russell Platt, and Vinny Golia. She plays regularly with the Vitamin String Quartet, Bridge to Everywhere (a professional ensemble promoting cross-cultural musical programming), and numerous other groups in the LA area. As a performance artist and comedian, Rachel has performed and hosted events across Los Angeles, most recently at the Troubadour, the Lyric Hyperion, Crown City Theatre, and the Clubhouse in Hollywood. Her work integrates traditional stand-up, clown, music and video to explore performance psychology, feminism, shame, pretension, and farts. Rachel is the Managing Director and Chamber Music Program Director at the Santa Clarita Valley Youth Orchestra, in addition to maintaining private teaching studios in the Santa Clarita and Glendale areas. She holds degrees from Oberlin Conservatory and California Institute of the Arts. She is a co-developer of the Minimally Invasive Gesture Sensing Interface (MIGSI) for trumpet: an open-source, wireless interface that captures performance data and provides real-time extended sonic and visual control for improvisation. Reid has presented and performed with MIGSI at institutions and festivals around the world including Stanford University’s Center for Computer Research in Music and Acoustics (CCRMA), the International Conference of New Interfaces for Musical Expression (NIME 2015: Brisbane, Australia), New Media Art & Sound Summit (NMASS 2017: Austin, TX), University of Oregon, UT Austin, and UC Irvine's Women in Music Technology Symposium (2016), among others. Oliver Jung, AKA Skullmattter, is a producer and performer of Bass and Wave music. Raised on puck rock, alternative, and hip-hop, Skullmatter’s work explores the dark and distorted edges of the electronic world. His time away from the studio is spent doing live sound for events across LA, digital visual work, and ingesting liberal amounts of caffeine. Ulrich Krieger is an internationally recognized German composer and saxophonist living in Southern California. He is known for his originality and innovation in composed and free improvised contemporary music. As a celebrated composer of chamber and electronic music, Krieger’s compositions are widely performed by ensembles in Europe and the USA. He works in variety of contexts; from new and experimental music to free improvisation, electronic music, reductionsim, noise, ambient, rock and metal. Krieger’s recent focus lies on the fringes of contemporary rock culture, in the areas of limbo where noise, metal, silence, and experimental chamber music meet. Not accepting stylistic categories, Krieger’s practice operates in the margins of 21st century genres while resisting the problematic trappings of appropriation. His compositional approaches include micro-sounds, microtones, reductionism, ‘instrumental electronics’ (instrumental music evoking the soundworld of electronics), drone, and noise; forms that often demand elaborate and nuanced amplification.